Today I have a unique article to share with you taken from a Japanese entertainment website I often visit. 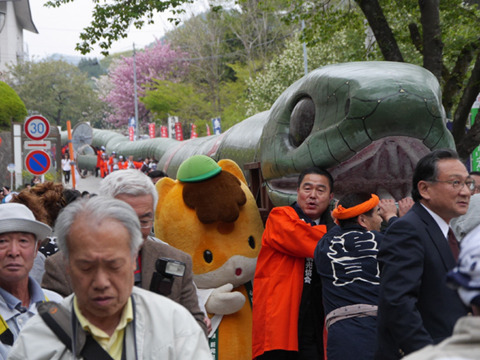 There was a “Dragon Festival” held in a hot spring resort town in Gunma prefecture the other day and the website was showing what was going on. 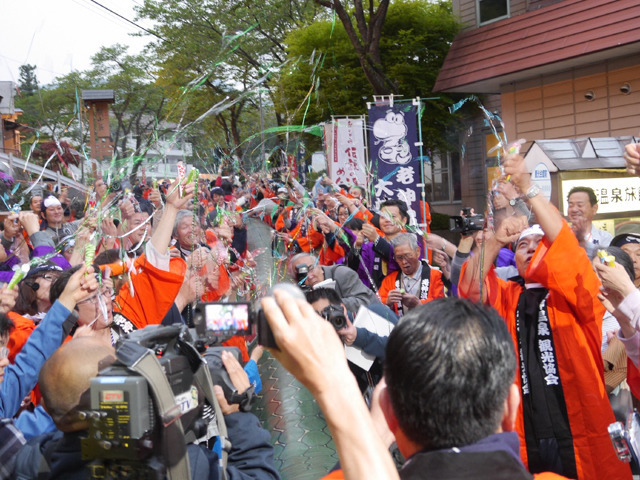 Have you heard of o-mikoshi? It is commonly seen that local people parade carrying it during festivals. 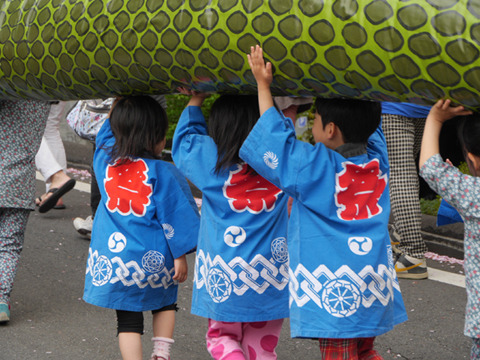 But during this dragon festival what people carried was not a shrine but it was a snake! 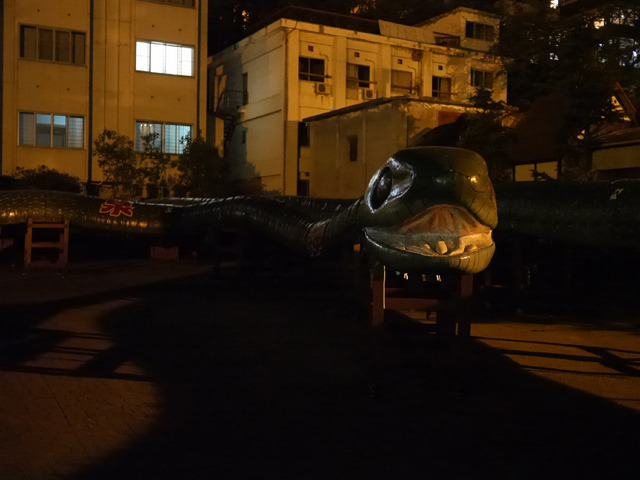 And, what was more, the snake was 108m long! 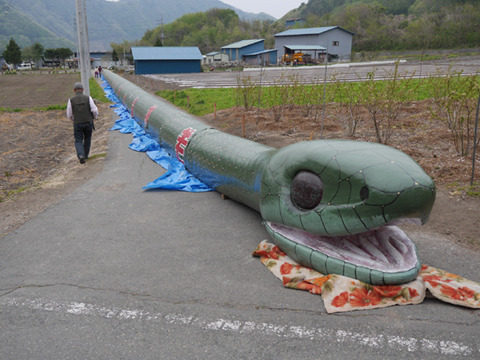 It has anyhow a mile long body so the only place the snake can be laid is on the farm road. 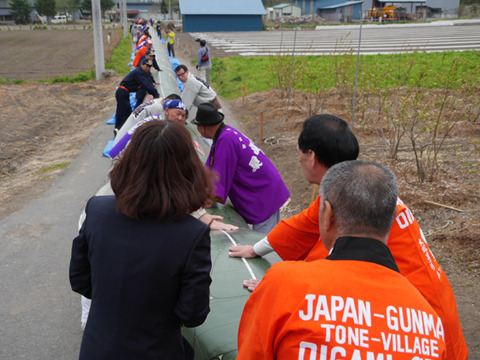 It is more than 100m long. Can they really carry such a gigantic snake? 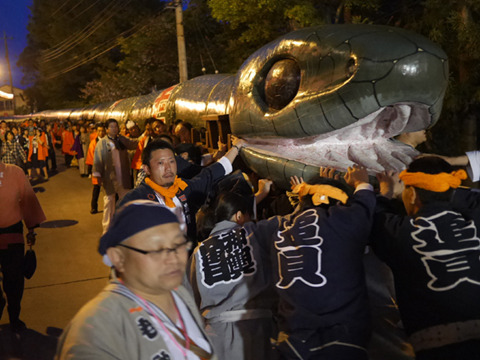 Below picture is a mini snake mikoshi carried by the local children which has made its appearance prior to the big dragon. After cute kids’ performance, here comes the big dragon. To start with, they measure the length. Is it going to be registered in Guinness Book of Records!? 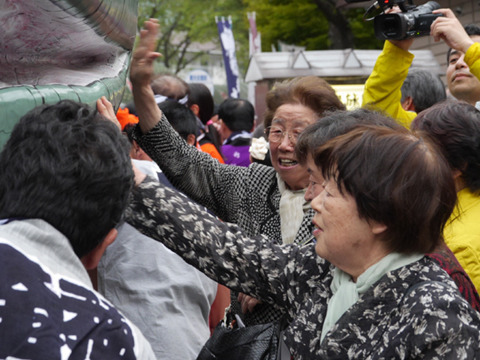 Meanwhile, people gather together and now are all ready to carry it. Joyful ladies are even touching it. Now shows up a qualified surveyor and makes an official measurement. They have already measured it once before but it looks like Guinness Records requires a double measurement. The local people waiting for a big moment. 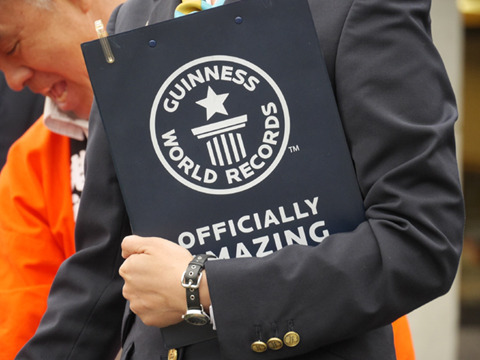 has just been recognized in Guinness Book of Records! The writer of this article here makes a remark, “People can be just happy only because a snake is long”. I share the same view! 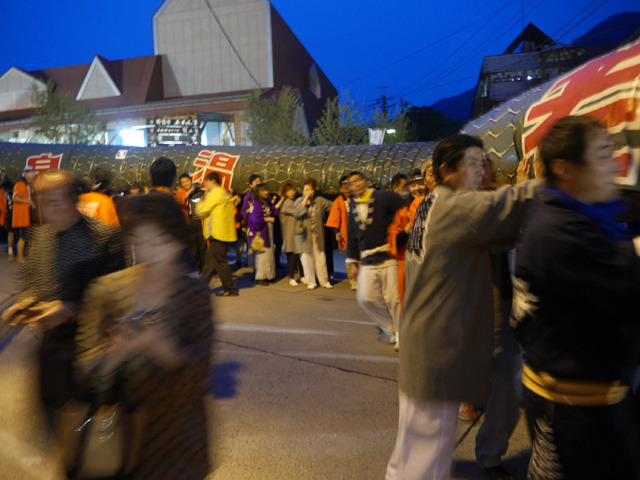 After the record has been certified, the people parade around the hot-spring resort town with the dragon on their shoulders. Not so easy to make a turn for a gigantic snake. After dark, the festival came to an end. The dragon left coiled in a parking lot after the festival. 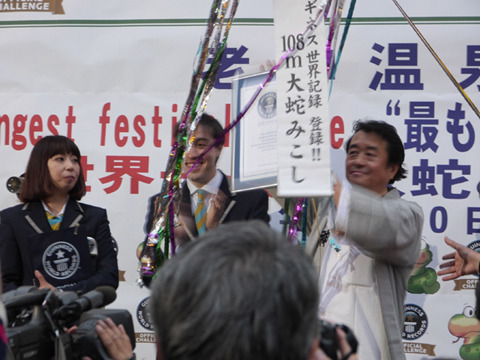 I never knew about this festival even though I am Japanese. 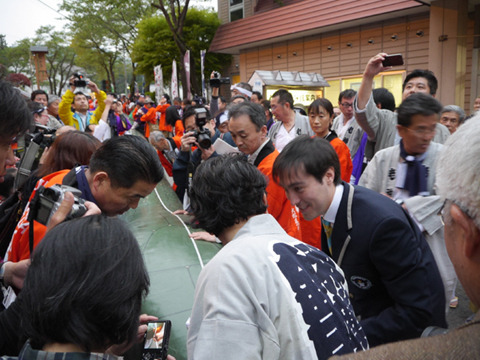 To give you a further explanation on what category it has been certified in the Guinness Book, it was certified as “the world record long snake o-mikoshi”. 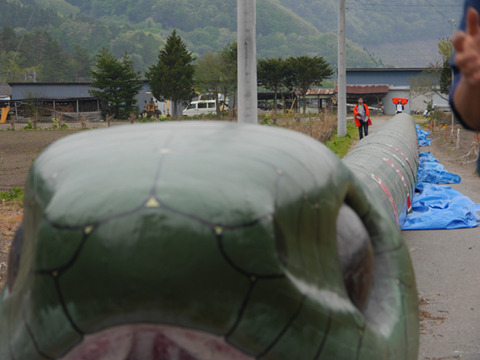 Until now, an 80m straw dragon (82.8m to be precise) in Sekikawa village, Niigata prefecture, held the longest record. 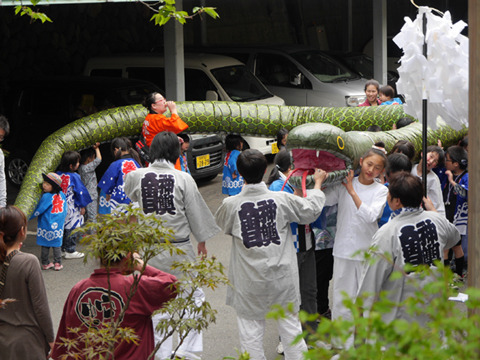 There are some other festivals associated with snakes in all over Japan and it is said that “Snake Summit” has been planned to take place in liaison with those communities who hold such festivals. But why only in Japan? It would be great if a worldwide snake summit comes true! Is Ordinary Day-Off Expensive in Tokyo compared with Other Global Cities?